Rory Lamont, like his brother Sean, grew up in Bottesford and went to the primary school and Belvoir High. He took up rugby as a pupil at King Edward VII School and played for Melton RFC before going on to achieve big things in Scottish colours. Born in Perth, he played fullback and on the wing for Glasgow Warriors and Scotland. He played for Northampton Saints and Northampton Old Scouts RFC after having left Saints. He is yet another international to have played for the Scouts that includes Ben Cohen, Steve Thompson and Courtney Lawes. In February 2009 joined RC Toulon in France but in November terminated his contract as he felt he was not getting enough playing time risking him losing his place in his Scottish side. He joined Glasgow Warriors in December 2011. Lamont made a memorable try scoring debut for Scotland in the 2005 Six Nations Championship match against Wales at Murrayfield. He also played for Scotland As against Australia A in the experimental position of inside centre. He played in the 2007 Rugby World Cup at full back, arguably being Scotland’s best back in the tournament. 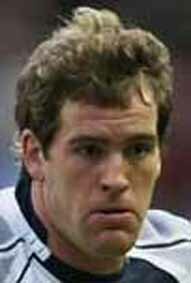 While playing Rugby on 8 March 2008, Scotland v England, Rory Lamont sustained a facial fracture. He returned for the 2011 World Cup, but only played one game, against Georgia. During the match against France in the 2012 Six Nations Championship, Lamont broke his leg. Lamont announced his retirement from professional rugby in April 2013, due to his inability to recover fully from the fracture.